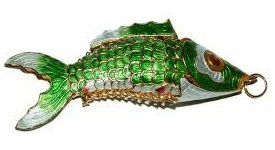 Cloisonne pendants are enameled metal, and produce a picture or mosaic similar to a stained glass window. These wiggle fish and animcals come in many colors and varieties. The choices displayed online are the current ones available. See our full selection of Cloisonne Beads.